TORONTO, ON – October 24, 2018 – Sharp. Sleek. Stunning. These are the words you’ll use to describe the 2019 Toyota Camry. Available in four-cylinder, V6 and self-charging hybrid powertrains, the Camry features a range of models and grades that let you pick the vehicle that suits your style. Regardless of your choice, every Camry delivers tremendous comfort, efficiency, style and technology – including, this year, Apple CarPlay as a standard feature on all models. The eighth-generation Toyota Camry is completely transformed, thanks to the Toyota New Global Architecture (TNGA). This revolution in powertrain and vehicle development enables Toyota to design and engineer vehicles with bolder styling, improved handling and performance, and better safety. TNGA enhances the 2019 Camry with a sleek, sporty body, plus a sweeping hood ending in distinctive upper and lower grilles. Many premium features are standard, including LED headlights and rear combination lamps, plus power adjustable and heated exterior mirrors with integrated signal lamps. Each trim level comes with uniquely-styled wheels, while the Sport model Camrys (the SE and XSE trim levels) feature sporty styling cues such as mesh-patterned grilles, side skirts and a unique rear fascia with spoiler to express their sportier performance. Inside, the modern cabin features a sweeping interior design with quality materials, exemplary ergonomics, and outstanding attention to detail. Camry drivers will appreciate the excellent support of the comfortable seats, and the thoughtful placement of instruments and controls to keep everything close to hand. TNGA does more than make Camry stunning: it also boosts performance and handling. Those who prefer sedans over SUVs do so, in part, for the superior driving experience they deliver, and Toyota engineers have taken great care to ensure the Camry experience really stands out. “S” series models feature sport-tuned suspension systems. The LE, XLE, SE and XSE grades are built around a 2.5 L four-cylinder Atkinson cycle engine that generates more than 200 peak horsepower. The XLE and XSE grades are also offered with the choice of a 3.5 L V6 that generates 301 peak horsepower. Both engines are paired with eight-speed direct shift automatic transmissions featuring sequential shift mode. For added driving fun, “S” series Camry models include steering wheel-mounted paddle shifters, while XLE and XSE trim levels feature a three-setting drive mode select system, with sport, normal and eco modes to match the Camry’s response to driver mood and road conditions. The Camry Hybrid models feature Toyota’s Hybrid Synergy Drive – the most popular and proven self-charging gasoline-electric hybrid powertrain on the planet. The drive is tailored to each vehicle. In the Camry, this system features a 2.5L four-cylinder Atkinson cycle engine, mated to an electronically controlled continuously variable transmission (ECVT), high-torque electric motor, high-capacity storage battery and sophisticated power management system. This system generates 208 net horsepower and exceptional fuel efficiency at 4.9 L / 100 KM city/highway combined. Toyota is committed to offering Canadians the most advanced bundle of in-car technology and connectivity services – and for 2019, the already well-equipped Camry is enhanced with the addition of Apple CarPlay as standard on all trim levels. This provides access to Apple apps including phone, music, maps, messaging, podcasts and more, as well as a number of third-party applications. It also extends Siri support to enable voice dictation and feedback for text messages and narration of data such as weather reports. Apple CarPlay joins the Entune connectivity service as standard in all Camry models. Entune 3.0 Audio enhances the audio system with Entune App Suite Connect and Scout GPS Link. Entune App Suite Connect provides access to traffic information, weather, Slacker, Yelp, sports and stock market results, fuel prices and more, while Scout GPS Link delivers smartphone-based navigation tools. In addition to Scout GPS Link and Entune App Suite Connect, XLE and XSE grades include Entune 3.0 Plus, which adds Entune Safety Connect with automatic collision notification, stolen vehicle locator, emergency assistance button and enhanced roadside assistance. The Camry XLE V6 features Entune 3.0 Premium Audio, which replaces Scout GPS Link with Embedded Navigation and adds Entune Destination Assist. And all Camry models feature a Display Audio system with auxiliary input jack, USB audio input, Bluetooth® connectivity, steering wheel-mounted controls, and more. Of course, the Camry wouldn’t be a Toyota without delivering impressive safety performance: Toyota is committed to making the road safer for all users and to leading the industry with innovative safety technology that’s available to all. Camry’s extensive list of safety technologies is headlined by Toyota Safety Sense P. This bundle of advanced systems includes the Pre-Collision System with Pedestrian Detection function, featuring forward collision warning and automatic emergency braking… Lane Departure Alert with Steering Assist function… Automatic High Beams… and Dynamic Radar Cruise Control. Other standard safety features include the six active technologies of the Toyota Star Safety System, 10 airbags, a backup camera, a tire pressure monitoring system with auto location, and an anti-theft system. The 2019 Toyota Camry LE Upgrade Package (Starting MSRP: $30,350) adds dual-zone automatic air conditioning, Entune 3.0 Audio Plus including Entune Safety Connect, an 8” Display Audio system, integrated Sirius XM Satellite Radio, the Blind Spot Monitor, Rear Cross Traffic Alert, and Back Guide Monitor safety systems, the Toyota Smart Key System with Push Button Start, a wireless charging system for personal electronics, an integrated garage door opener, and an auto-dimming rear view mirror with Homelink system and integrated compass. 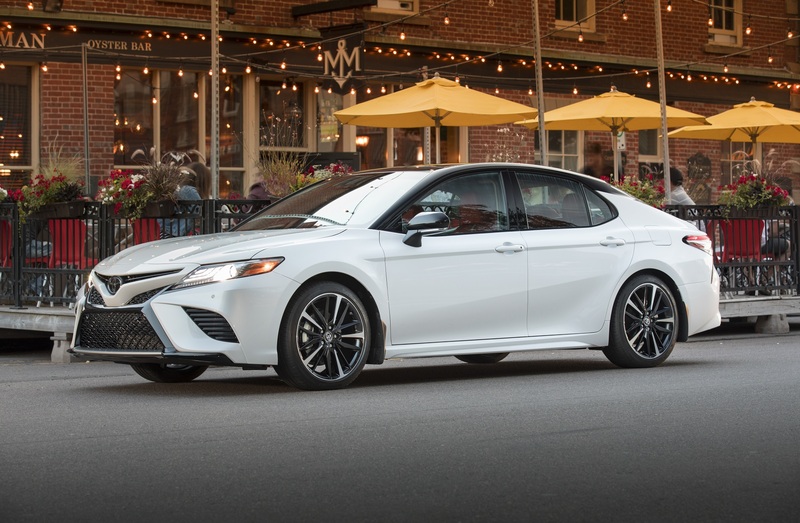 For those looking to maximize value – for example, in fleet service – the 2019 Toyota Camry LE Base Package (Starting MSRP: $26,390) reduces the MSRP by substituting some premium features with less expensive options. These include deleting the seat heaters, replacing the power-adjustable driver’s seat with a manually adjustable seat, and fitting the Camry with 16” steel wheels with wheel covers. The 2019 Toyota Camry XLE Navigation Package (Starting MSRP: $36,390) is a new model for 2019 and adds 18” alloy wheels, Entune 3.0 Premium Audio with embedded navigation, and a JBL Audio system with 8” display and nine speakers. The 2019 Toyota Camry XLE V6 (Starting MSRP: $40,990) includes all of the features in the Camry XLE Navigation Package, plus the added power and performance of the 3.5L V6 engine. It then adds a number of Toyota safety technologies – including the 10” Head Up Display, Rear Cross Traffic Brake system, the Birds Eye View Monitoring system, and intelligent clearance sonar. The 2019 Toyota Camry SE Upgrade Package (Starting MSRP: $31,150) adds 18” alloy wheels, dual-zone automatic air conditioning, Entune 3.0 Audio Plus including Entune Safety Connect, an 8” Display Audio system, integrated Sirius XM Satellite Radio, the Blind Spot Monitor, Rear Cross Traffic Alert, and Back Guide Monitor safety systems, the Toyota Smart Key System with Push Button Start, a wireless charging system for personal electronics, an integrated garage door opener, a power tilt/slide moon roof, and an auto-dimming rear view mirror with Homelink system and integrated compass. The 2019 Toyota Camry XSE (Starting MSRP: $34,690) enhances its curb appeal with 19” alloy wheels, a panoramic glass roof, premium LED headlamps, LED Daytime Running Lights, and premium LED rear combination lamps. Inside, this model features dual zone automatic air conditioning, leather-wrapped steering wheel and shift knob, leather seat surfaces, heated front sport seats including an eight-way power adjustable driver’s seat and six-way power adjustable front passenger’s seat, auto-dimming rear view mirror with integrated compass, ambient lighting system and an integrated garage door opener. The XSE’s impressive list of technology features includes the Entune 3.0 Audio Plus system including Entune Safety Connect, an 8” Display Audio system with six speakers, integrated Sirius XM Satellite Radio, a 7” multi-information display, a wireless charging system for personal electronics, the Blind Spot Monitor, Rear Cross Traffic Alert, and Back Guide Monitor Alert safety systems, and the Toyota Smart Key System with Push Button Start. The 2019 Toyota Camry XSE V6 (Starting MSRP: $39,990) includes all of the features in the Camry XSE, plus the added power and performance of the 3.5L V6 engine. It then adds a number of Toyota safety technologies – including the 10” Head Up Display, Rear Cross Traffic Brake system, the Birds Eye View Monitoring system, and intelligent clearance sonar. The 2019 Toyota Camry Hybrid LE (Starting MSRP: $31,550) features dual-zone automatic climate control with humidity sensor, fabric seat surfaces, heated front seats, eight-way power adjustable driver’s seat, a 4.2” multi-information display, the Toyota Smart Key System with Push Button Start, 17” alloy wheels, and more. The 2019 Toyota Camry Hybrid XLE (Starting MSRP: $40,790) feature Entune 3.0 Premium Audio with embedded navigation, integrated Sirius XM Satellite Radio, a nine-speaker JBL Synthesis audio system with 8” display, leather seating, heated front seats, eight-way power adjustable driver’s seat and six-way power adjustable front passenger’s seat, a 7” multi-information display and 10” Head Up Display, auto-dimming rear view mirror with Homelink and integrated compass, leather-wrapped steering wheel and shift knob, leather door trim, aluminum scuff plates, ambient lighting and an LED cabin illumination system, an integrated garage door opener, the Smart Key System with Push Button Start, a wireless charging system for personal electronics, 18” premium alloy wheels, a power tilt/slide moon roof, Premium LED headlights and rear combination lamps, LED daytime running lights, and more. In addition, safety is enhanced with several technologies including the adaptive front lighting system, auto-levelling headlamp system, the Birds Eye View Monitor, Rear Cross Traffic Alert, Blind Spot Monitor, and Rear Cross Traffic Brake. The 2019 Toyota Camry Hybrid SE (Starting MSRP: $34,250) is the sporty hybrid, featuring all of the performance upgrades and styling cues of the “S” series plus the advanced performance and efficiency of the Hybrid Synergy Drive. Other features include Entune 3.0 Audio Plus including Entune Safety Connect, an 8” Display Audio system with six speakers, integrated Sirius XM Satellite Radio, heated front sport seats clad in sport fabric with leatherette trim, a 4.2” multi-information display, aluminum scuff plates, the Smart Key System with Push Button Start, integrated garage door opener, wireless charging system for personal electronics, the Blind Spot Monitor and Rear Cross Traffic Alert safety systems, 18” alloy wheels, a power tilt/slide moon roof, and more. The 2019 Toyota Camry and 2019 Toyota Camry Hybrid are now on sale at Toyota Dealers across Canada. For complete and up to date details and specifications, visit www.toyota.ca/camry.